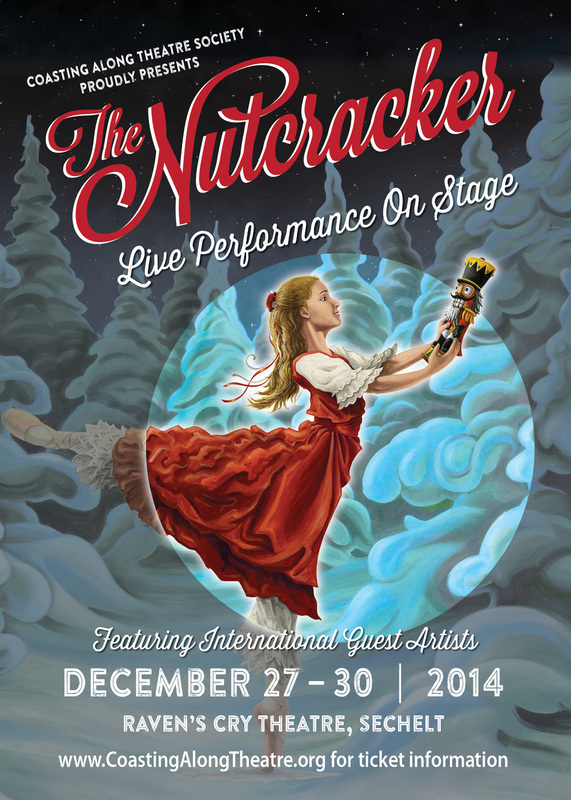 Nutcracker 2015 - before Christmas this year! For the third straight year, Coasting Along Theatre Society’s performance of The Nutcracker enchanted and dazzled near-capacity audiences at Raven’s Cry Theatre in Sechelt. Artistic director Kathleen Holmes staged a masterful rendition of this Christmas classic, framed by Cody Chancellor’s deceptively simple sets and lushly costumed by designer Conchita Harding. Part of the enchantment of The Nutcracker is the diversity of characters in the cast, showcasing a range of ages and talents (including some non-dancers). With the exception of Calgary’s Roxy Drewitz, who alternates with the Coast’s Jasmyn Evered in dancing the role of Clara, and Yuta Kawakami as the Nutcracker Prince, the entire first act is dominated by talented Sunshine Coast performers — and stolen, outright, by Pan Willson as Clara’s mysterious godfather, Herr Drosselmeyer. Flashing a devilish grin and a cape he was born to wear, Willson embodied the larger-than-life toymaker/magician and dominated the stage. Probably no one else, ever, could wear a neon blue sequined tuxedo shirt with such macho insouciance. Holmes continued the tradition of having professional dancers in the lead roles — not just to add to the performance, but to inspire and inform the young dancers in the corps de ballet. Yuta Kawakami as the Nutcracker Prince also performed a vivid Russian dance solo. Two Brazilian-born dancers, Ana Paula Oioli as the Snow Queen and a glittering Dew Drop Fairy with Diego Ramalho as the Snow King and a Mirliton (music box dancer), delighted with their grace and energy. Miguel Nguyen returned to enthrall with a muscular performance as the Cavalier, supporting the ethereal Erin McNeill as the Sugar Plum Fairy. Kathleen and her husband, the late David Holmes — both classically trained and with years of performance experience with some of Russia’s top ballet companies — arrived on the Coast with a dream of staging full dance theatre productions. 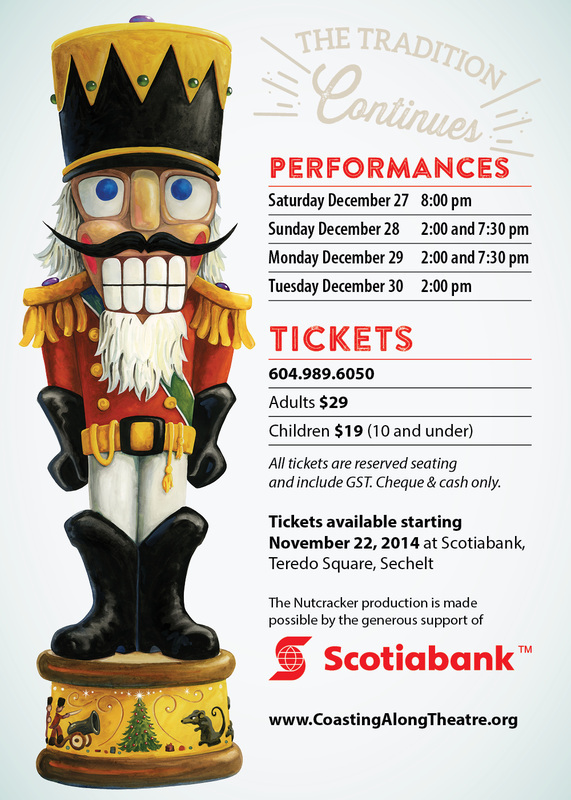 In 2011 they established Coasting Along Theatre Society and packed the Gibsons Heritage Theatre for the first Nutcracker. Training for months to learn the Holmes’ choreography as well as the sensibilities and nuances of Russian-style ballet, the young women and men of the Coasting Along company experience the heartbreaking dedication essential to a successful dancer — and the exhilaration of a final whooping, whistling ovation from an enthusiastic first-night audience. Video shot, edited, designed by Dan Tsuji - amazing job! Thank you!